Sister Candida, from Veneto, was born on February 20, 1907, and baptized Alma Bellotti at Quinzano, in the province of Verona; “she left this earth with the serenity that always distinguished her,” reads the press release. Having entered the Congregation of the Ministers of the Sick of Saint Camillus in 1931, Sister Candida served as a professional nurse in several cities of Italy. In 2000 she transferred to the Motherhouse of the Luccan Institute. 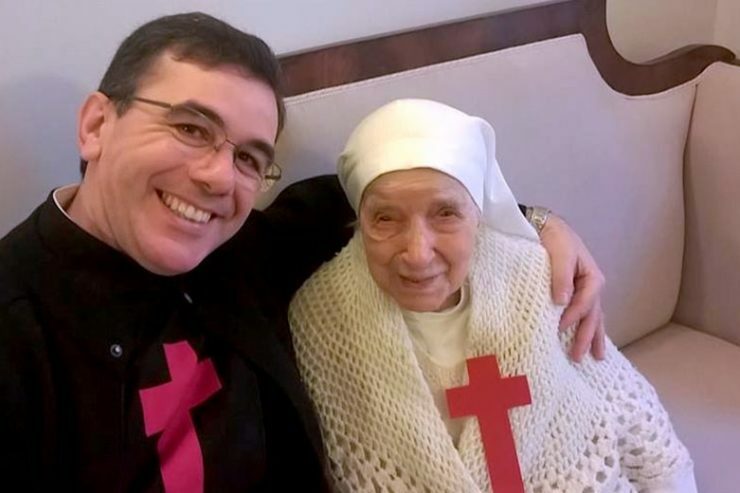 She celebrated her last birthday on February 20 of this year, in the presence of the Bishop of Lucca, Monsignor Italo Castellani, of the Provincial Superior, Sister Giuliana Fracasso and fellow Sisters. She also received greetings from Pope Francis. “To Reverend Sister Candida Bellotti, Sister Minister of the Sick, who with a grateful spirit to God is celebrating her 110th birthday, the Holy Father Pope Francis, participating spiritually in the common joy for the happy recurrence, expresses sincere congratulations and fervid good wishes,” stated the Apostolic Blessing. Sister Candida met the Pontiff personally in 2014, when on the occasion of her 107th birthday and the 400th anniversary of the death of Saint Camillus of Lellis, the elderly nun took part in the morning Mass in the Chapel of Casa Santa Marta in the Vatican. The deceased religious lived under ten Pontiffs: Pius X (1903-1914), Benedict XV (1914-1922), Pius XI (1922-1939), Pius XII (1939-1958), John XXIII (1958-1963), Paul VI (1963-1978), John Paul I (1978), John Paul II (1978-2005), Benedict XVI (2005-2013), becoming Pope Emeritus after his renunciation) and finally Pope Francis (from 2013).